Turkey would be able to ensure its national security only in close cooperation with the Syrian government of Bashar al-Assad, which remains a powerful force unifying Syria's ethnic and religious communities, Turkish analysts told Sputnik. "Instead of collaborating with the US that supports terrorist organizations which threaten Turkish national security, Turkey should focus on building cooperation with regional players, giving priority to its own well-being and stability of the region," Hasan Bitmez, the deputy head of the opposition Turkish Saadet Party (Felicity Party), told Sputnik Turkey. The politician condemned Ankara for hailing the April 14 joint strike on Syria by the US, France and the UK, stressing that the Western countries first and foremost targeted Syria's territorial integrity. According to Bitmez, the Turkish government's statement regarding the US-led coalition's attack on Syria contradicts both Turkey's historical past and its geographical location. "The imperialist forces' attack — contradicting the norms of international law — on one of our neighbors and a Muslim country is unacceptable under any pretext," the politician emphasized. On the other hand, French President Emmanuel Macron's remark that the strike has "divided" the Russians and the Turks also indicates that Turkey was one of the targets of the attack, according to Bitmez. "This process is connected not only with Syria; it also embraces Turkey, Iran and Iraq. Once the United States, France, Britain and Israel achieve their goals in Syria, Iran and Turkey's turn would come. The Turkish government should not ignore this fact," he highlighted. The politician pointed out that instead of implementing the policy of the US, which supplies the Kurdistan Workers' Party (PKK), outlawed in Turkey, and the Democratic Union Party (PYD) with weapons, Ankara should put the region's interests first. "One must understand that the support of the US' Syria strike means facilitating the strengthening of positions of Kurdish People's Protection Units (YPG) and the PKK in northern Syria," he highlighted. For his part, Utku Reyhan, the general-secretary of Turkey's left-wing Vatan Party (the Patriotic Party), opined that Damascus should be included into the Russia-Iran-Turkey format of the Astana talks. "Turkey should not act in accordance with the interests or to the benefits of any country on the Syrian issue," he stressed. "First of all, [Ankara] must think about its own population, economy and security." According to the head of the Vatan Party, Syria's unity, which could be provided by the government of Bashar al-Assad, plays directly into the hands of Turkey. Additionally, Turkey's struggle with the PKK could prove efficient only under the conditions of Turkey-Syria cooperation, he believes. "One of the most important prerequisites that make this possible is the continuation of the trilateral cooperation of Turkey, Russia and Iran, and, furthermore, the inclusion of Damascus in the negotiation process," he said. He believes that Ankara should take initiative in ensuring Syria's unity. Cooperation between Moscow, Tehran, Ankara and Damascus is of vital importance for the future of both Syria and Turkey, Reyhan stressed. "For this reason, the Turkish government should avoid statements that may create an atmosphere of mistrust in relations with Russia and Iran. Such statements will not benefit Turkey's national security," the politician emphasized. Reyhan reiterated that only the Assad government is able to unite all religious and ethnic groups of the country. "All reasonable countries should understand that the future of Syria cannot be separated from Assad, since there is no other force similar in strength to ensure the territorial integrity of Syria," the Turkish politician pointed out. Commenting on Macron's statement on the alleged "division" between Russia and Turkey, which was later refuted by both Moscow and Ankara, Reyhan suggested that the French president's move was prompted by a lack of political and diplomatic experience. "It seems that he doesn't realize that such verbal attacks only facilitate a Russian-Turkish rapprochement." According to Reyhan, many among pro-government media sources and the ruling Justice and Development (AKP) Party understand the essence of this provocation. "No matter how many representatives of the [Turkish] government express satisfaction with the missile strike on Syria, a number of publications close to the [Turkish] authorities and even some politicians note that this attack was a provocation aiming, in particular, to spoil Turkish-Russian relations," the politician emphasized. 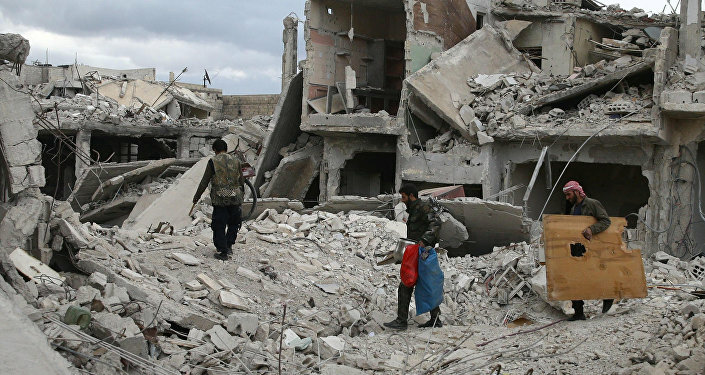 On April 14, the US, France and the UK conducted a massive missile strike on Syria under the pretext of the alleged use of chemical arms in Douma, Eastern Ghouta, which was groundlessly blamed of the Syrian government, on April 7. However, the Russian Defense Ministry's chemical corps commission reported on April 10 that it had found no traces of chemical poisoning with chlorine or sarin after careful examination of situation in Douma. On April 8, the Turkish Foreign Ministry stated that it had "suspicions" that the alleged chemical attack was conducted by Syrian government forces. Following the strike, Turkish President Recep Tayyip Erdogan stressed that the attack was a powerful message to Damascus. Ankara's reaction prompted Macron to claim that "with these strikes and this intervention, we [the US-led coalition] separated the Russians and the Turks on this issue." In response, Turkish Foreign Minister Mevlut Cavusoglu stated: "We [Turkey and Russia] can think differently but they (our relations with Russia) are not so weak that the French president can break them."